Know of a good book to eat?! Create an Edible Book for UC Libraries International Edible Books Festival. Officer Lance Long and K-9 Dozer, left, pause during training at the Von Liche K-9 training facility in Indiana with officer Rob Doherty and K-9 Boomer. Take a break from your studies and come meet Dozer and Boomer, Labradors in the K-9 Unit of UC’s Public Safety Department. Dozer and Boomer will be visiting Langsam Library on Monday and Tuesday, December 7th and 8th from 11:00 to 11:30am and 1:00 to 1:30pm both days. For more information about the K-9 Unit, http://www.uc.edu/News/NR.aspx?id=22556. Are You A Fan of the Renovated Langsam Classroom? The Bearcat Is. This summer, Langsam Library classroom 462 was renovated to improve functionality and to provide new capabilities for both students and instructors. The renovated learning classroom has been enlarged and features a curved, glass wall for added visibility. New modular furniture and six large display screens connected to a main projection screen allow for flexible and responsive collaboration opportunities. Wireless access provides for seamless connectivity to the Internet with laptops. The renovations to Langsam 462 are part of a university pilot project to create an active learning classroom. Four UC professors are using and testing the enhanced learning classroom this semester and providing feedback for use in planning similar spaces across campus. The Bearcat visited the learning classroom recently and gave it two paws up. Once again, the University of Cincinnati Libraries will celebrate the International Edible Books Festival with an event scheduled for Wednesday, April 1st from 1-2 p.m., on the 5th floor lobby of Langsam Library. Professor Jack Davis of UC’s Classics Department is a regular visitor to the Archives and Rare Books Library. Recently he has been examining the Joseph Alsop papers, which contain a manuscript copy of Alsop’s book, From the Silent Earth, a Report on the Greek Bronze Age and correspondence about the manuscript. Below is the first of a series of blogs in which Jack Davis discusses Joseph Alsop and the collection in ARB. It was originally published on From the Archivist’s Notebook, a blog of Natalia Vogeikoff-Brogan, head of the archives at the American School of Classical Studies at Athens. 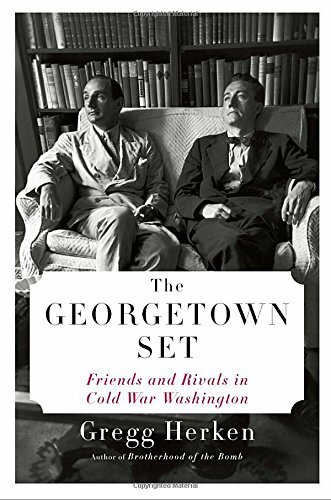 Several months ago Louis Menand’s New Yorker review (Nov. 10, 2014) of Gregg Herken’s The Georgetown Set: Friends and Rivals in Cold War Washington kindled my interest in Joseph W. Alsop (1910-1989), influential journalist, syndicated newspaper columnist, and trustee (1965-1985) of the American School of Classical Studies at Athens. A bit of archival sleuthing at the University of Cincinnati (see below) led to the discovery that on Saturday, December 14, 1963, Alsop had summoned an A-list of Classical archaeologists and art historians to dine with him and his wife, Susan Mary, in their Georgetown, Washington, D.C., home — a strange flock for this longtime Washington insider to host. Friday, February 13, 3-5pm, Langsam Library. Enjoy refreshments and entertainment while you participate in interactive activities such as calligraphy, origami, haiku readings and more. Visit the Student Technology Resources Center (STRC) and make a video postcard greeting. Listen to music and play games as you welcome in the year of the goat (or sheep). The Lunar New Year celebration in Langsam Library is part of a Diversity Grant the Libraries received to promote and celebrate diversity throughout the university. The event is supported by the Chinese Mutual-Aid Association and the Japanese & American Student Society and sponsored in part by Ethnic Programs and Services. The vampires, ghosts, goblins and otherwise scary creatures in UC Libraries wish you a safe and happy Halloween. May you receive more tricks than treats. Students and Staff of The Desk @ Langsam modeling the Halloween spirit. Halloween mayhem in Langsam Library. Follow UC Libraries on Instagram to see a whole new side of the people, places, spaces and collections of UC Libraries. You can find us at http://instagram.com/uc_libraries or with the hashtag #uclibraries. Table Tennis Anyone? This Friday. Attending the Table Tennis Tournament on Friday in Langsam? The tournament playoff will be held at the Rec Center, 1st floor, Court 1 at 4pm. When they are down to the final round, at around 5 pm, the final four will be playing at Langsam Library, 4th floor, against the Library team led by the Dean and University Librarian Xuemao Wang. It is important that anyone who will attends the Rec Center game bring their UC ID for admittance. Come and cheer on your fellow Bearcats.